Safety Score: 5,0 of 5.0 based on data from 9 authorites. Meaning it is not safe to travel Libya. Libya with its capital Tripoli is located in Africa (Northern Africa, bordering the Mediterranean Sea). It covers some 1,759,541 square kilometers (about 2.5 times the size of Texas) with a population of 6,653,210. Arabic, Italian and English are the languages spoken by people in Libya (consider regional differences). Algeria, Chad, Egypt, Niger, Sudan and Tunisia are bordering countries. Libya is a country in North Africa. In the north it has a Mediterranean Sea coast, with Egypt to the east and Tunisia to the west. More than 90% of the country is desert or semidesert. To reach someone Libya dial +218 prior to a number. The local cellular networks are operated on 900 MHz, 3G, 4G. Websites typically end with the top level domain ".ly". If you want to bring electric appliances (e.g. battery chaarger), keep in min the local 230 V - 50 Hz (plugs: C, L). The sign for the locally used currency Dinar is LYD. 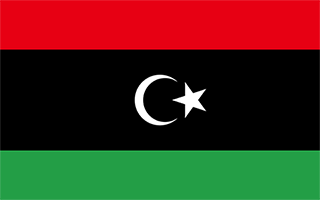 Three horizontal bands of red (top), black (double width), and green with a white crescent and star centered on the black stripe; the National Transitional Council reintroduced this flag design of the former Kingdom of Libya (1951-1969) on 27 February 2011; it replaced the former all-green banner promulgated by the QADHAFI regime in 1977; the colors represent the three major regions of the country: red stands for Fezzan, black symbolizes Cyrenaica, and green denotes Tripolitania; the crescent and star represent Islam, the main religion of the country. The Italians supplanted the Ottoman Turks in the area around Tripoli in 1911 and did not relinquish their hold until 1943 when they were defeated in World War II. Libya then passed to UN administration and achieved independence in 1951. Following a 1969 military coup, Col. Muammar al-QADHAFI assumed leadership and began to espouse his political system at home, which was a combination of socialism and Islam. During the 1970s, QADHAFI used oil revenues to promote his ideology outside Libya, supporting subversive and terrorist activities that included the downing of two airliners - one over Scotland, another in Northern Africa - and a discotheque bombing in Berlin. UN sanctions in 1992 isolated QADHAFI politically and economically following the attacks; sanctions were lifted in 2003 following Libyan acceptance of responsibility for the bombings and agreement to claimant compensation. QADHAFI also agreed to end Libya's program to develop weapons of mass destruction, and he made significant strides in normalizing relations with Western nations. Unrest that began in several Middle Eastern and North African countries in late 2010 erupted in Libyan cities in early 2011. QADHAFI's brutal crackdown on protesters spawned a civil war that triggered UN authorization of air and naval intervention by the international community. After months of seesaw fighting between government and opposition forces, the QADHAFI regime was toppled in mid-2011 and replaced by a transitional government known as the National Transitional Council (NTC). In 2012, the NTC handed power to an elected parliament, the General National Congress (GNC). Voters chose a new parliament to replace the GNC in June 2014 - the House of Representatives (HoR), which relocated to the eastern city of Tobruk after fighting broke out in Tripoli. In October 2015, the UN Special Representative of the Secretary General (SRSG) to Libya, Bernardino LEON, brokered an agreement among a broad array of Libyan political parties and social groups - known as the Libyan Political Agreement (LPA). Members of the Libyan Political Dialogue, including representatives of the HoR and ex-GNC, signed the LPA in December 2015. The LPA called for the formation of an interim Government of National Accord or GNA, with a nine-member Presidency Council, the HoR, and an advisory High Council of State that most ex-GNC members joined. The LPA’s roadmap for a two-year transition to a new constitution and elected government was subsequently endorsed by UN Security Council Resolution 2259, which also called upon member states to cease official contact with parallel institutions. In January 2016, the HoR voted to approve the LPA, including the Presidency Council, while voting against a controversial provision on security leadership positions. In March 2016, the GNA Presidency Council seated itself in Tripoli. In 2016, the GNA twice announced a slate of ministers who operate de facto, but the HoR did not endorse the ministerial list. HoR and ex-GNC-affiliated hardliners continued to oppose the GNA and hampered the LPA’s implementation.